With all the growth in Edmonton over the past five years, it’s been easy to overlook a recent trend: Our city is getting smaller. That is, many people are choosing to live smaller, and not because they have to. There is no physical reason Edmontonians need to live more densely – unlike Vancouver, New York City and Toronto, the one thing we have is space. But people have more personal reasons for choosing to live small. 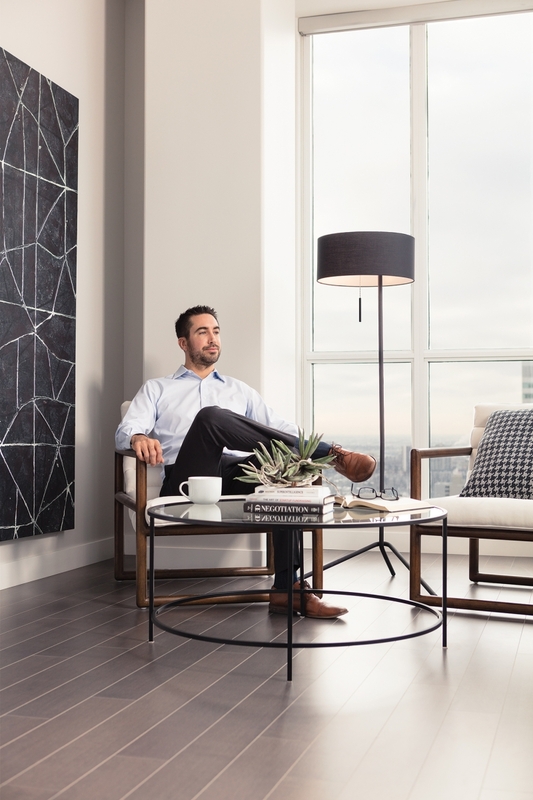 Like most of the city’s recent growth, micro condo living started central, and it doesn’t get more central than Ultima Condominiums, which sprouted up a block south of Rogers Place in 2016. There are seven units on each of the 27 suite floors, one of which measures 515 square feet, and others ranging up to 665 sq. ft. It’s compact luxury, surrounded by some of the city’s best food and entertainment. It’s what Dylan Kelley wanted when he studied the Ice District plan before cranes crowded the city’s core. “I bought it pre-construction, knowing eventually this would all be here,” he says. The result is a posh living space with navy blues and olive greens taking leads from the black walls and white wainscoting, filled with round tables and low, deep couches to maximize the space and scenery. With Flis’s signature standout lighting fixtures – the “jewellery of the space” – it has the look of a luxury hotel, where every suite has a view. The occupant demographic does average younger which, along with the oven-less stove tops, provided mattresses and communal laundry rooms, adds to the building’s dorm vibe, but the 10 floor plans, ranging from 340 to 450 sq. ft., offer freedom to live less burdened, no matter your age or financial situation. This includes a retired schoolteacher who owns and rents out a full-sized condo in the west end, while spending six months per year in the Dominican Republic and the other six in her Crawford Block condo. It’s a change they’re banking on, as Beljan is currently redeveloping the old downtown YMCA, divvying up 80,000 square feet into 100 micro apartments, ranging from 240 to 450 sq. ft., atop a food hall and health and fitness space. “What we’ve learned here, we’ll carry over there, and make it even better for people looking for a minimalist lifestyle,” he says. Crestview Tower Micro Condo: Living Room Cabinetry – Ikea; Living Room Chairs – Mobler Modern Furniture; Pop-down Dining Table, Custom sofa, murphy bed, cabinetry around murphy bed – Wallbeds, Etc. 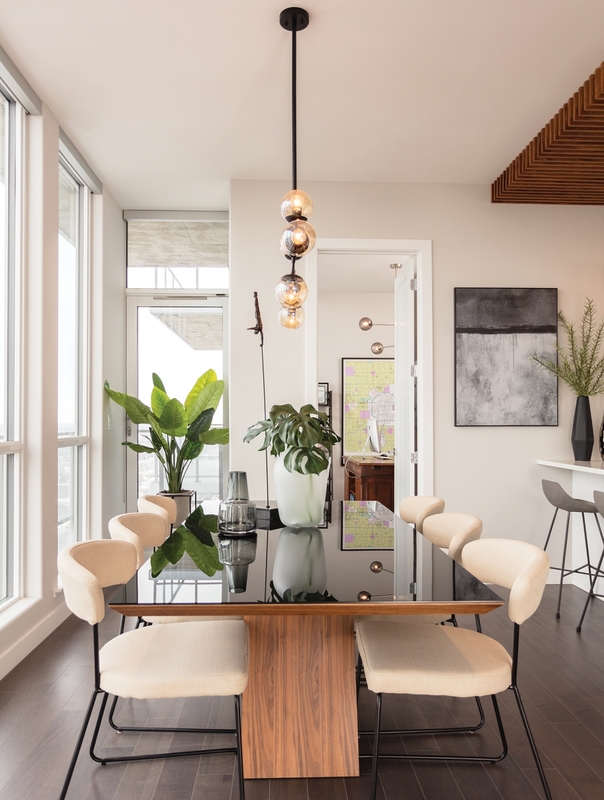 Tiny living isn’t for everyone and, like the big cities from which it has taken cues, Edmonton will eventually envelop its surrounding communities, even as the small and central trend continues. But for people of all demographics, whether for reasons personal, practical, economical or environmental, living happy can mean living small. 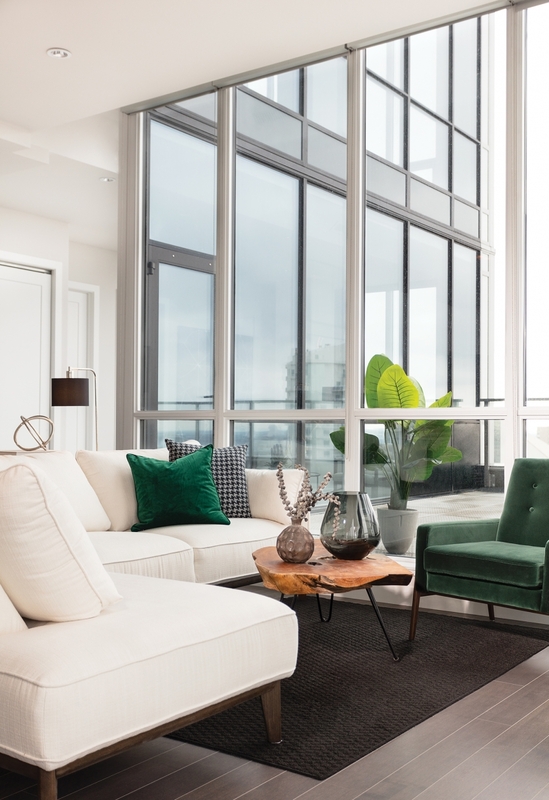 Of course, not all central living is small, though condo living is quite different from a detached home, and with new downtown condo developments comes the surest sign of luxury living: The high-rise penthouse. Four sub units below the massive 2,706 sq. ft. penthouse crown the Ultima tower, creating 180-degree views that didn’t exist just a few years ago. 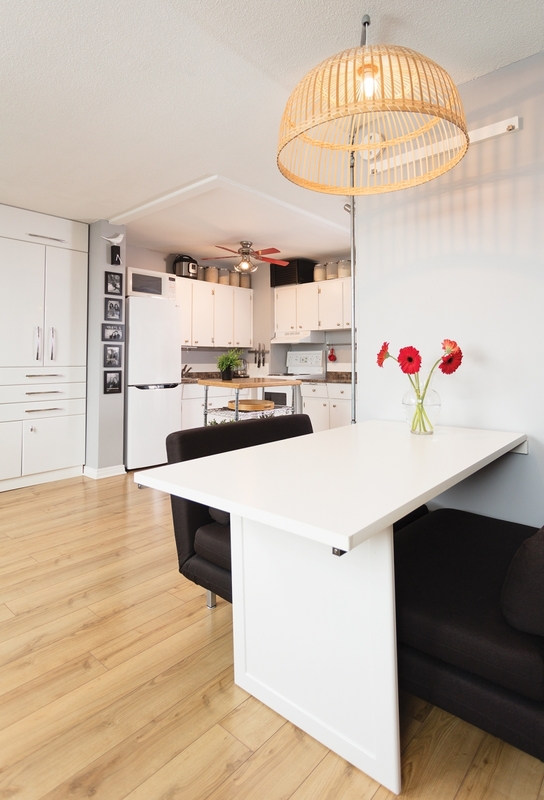 Dylan Kelley moved into one of the smaller sub penthouse units, but maintains his micro-condo and rents it out, about a year after returning to Edmonton. It was a move sadly precipitated by his father’s sudden passing, after which he rebranded the family’s land sale business. “I started as a kid, riding around with him to different counties, doing deals,” he says. Kelley’s now carrying on his family’s legacy, symbolized best by his father’s cherished desk, which comes with Kelley no matter which downtown development he occupies. “There have been lots of deals done on this desk,” he says. 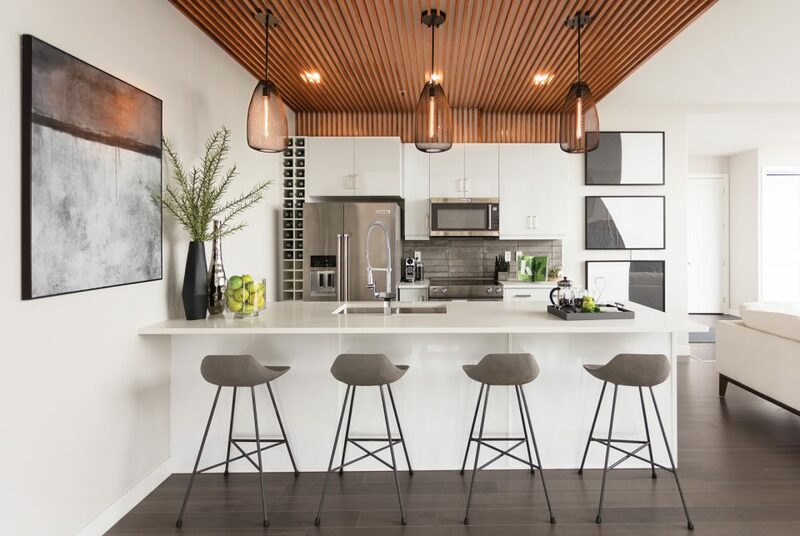 Like the micro units below, deep, low furniture fills the middle of the unit, leaving sightlines unobstructed and open access to each patio – even the television is mounted on a pillar away from the windows. The 10-foot ceilings allow room for a massive dining room chandelier and a custom made, antique-walnut stained, red oak ceiling treatment over the kitchen. The canvas-like white walls brighten the space further, detailing the walnut counters and highlighting the pops of dark green throughout. The northeast unit also provides the clearest view of what may end up being the city’s best, in terms of downtown living – the 36 floors of the Sky Residences in the Stantec Tower, which will be south of Rogers Place and overlook the future home of the Public Plaza. 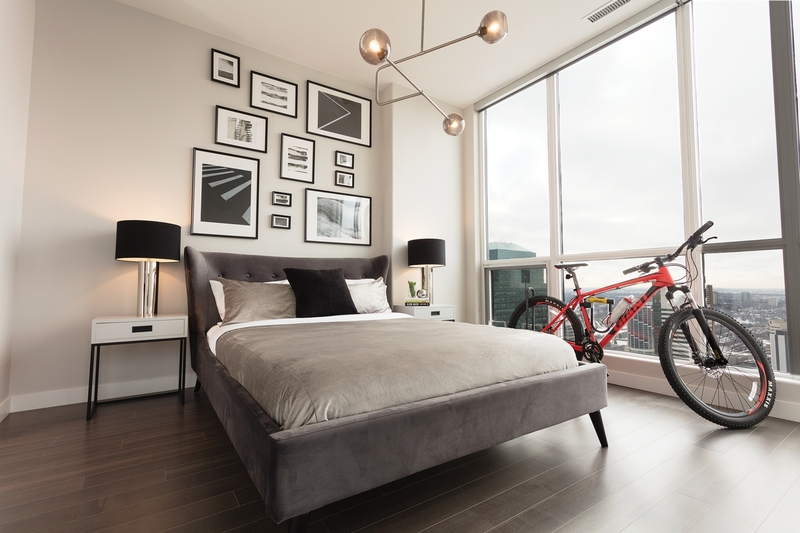 Like Ultima, Sky units will range starting from 556 square feet, and be walking (or biking) distance to pretty much everything downtown, largely connected by pedway systems. Taken all together, it starts to look like Big City developments in a town that’s long lacked a vibrant core. One could argue it’s all long overdue, but you can’t deny the progress so far, and all the sky scraping signs of a city reaching its prime.